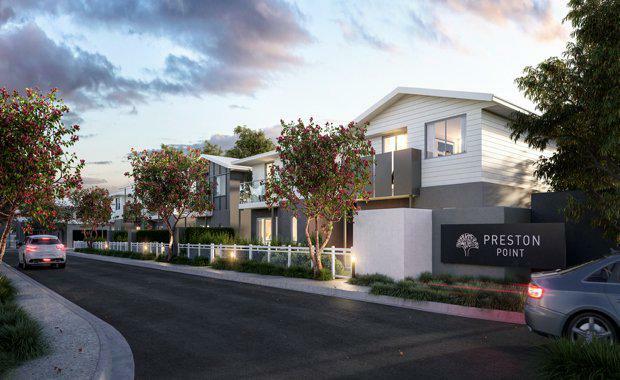 A townhouse development which sells itself on privacy, lifestyle and green space in Brisbane’s north has been recently launched by Unison Projects. Construction of the 74-townhouse development featuring a resort-style recreation space on a 3.2 hectare parcel on the former Hawkins Garden Centre site at 623 Albany Creek Road, Albany Creek, has commenced following 12 months of civil works. Unison Projects’ Matt O’Driscoll said the $37 million estate has been named Preston Point following a competition involving Albany Creek State High School students who were invited to suggest a name and explain their inspiration. “There were many entries with lots of brilliant ideas but the successful entry came from students Madalyn Martin, Kirra Young and Stephanie McBean,” Mr O’Driscoll said. Mr O’Driscoll said the Preston Point Residences offers a creekside urban retreat and will feature a 16m residents’ swimming pool with wrap around deck, BBQ area, fire pit, bocce court, communal vegetable garden and large lawn area with football posts. “This will be a truly ‘green’ community on the banks of Albany Creek, with just two thirds of the 3.2 hectare site being developed to provide for extensive private green open space and retention of stately 100-year-old fig trees,” he said. Mr O’Driscoll said the architect designed townhouses will have broad appeal to a range of potential buyers from people entering the property market to downsizers who want to stay in the popular and well-serviced area. “With 18 varieties of terrace designs and numerous facades to choose from, there’s a stunning new home to suit all tastes,” he said. “The homes have been masterfully designed to cohabit with their natural surrounds.